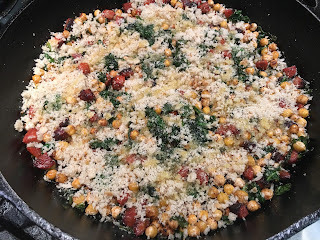 I was having a hankering for chickpeas and since we still had some Dona Juana chorizo Bilbao in the freezer, Mark Bittman's New York Times Cooking recipe that combined them with spinach quickly came to mind. I've been meaning to try it for some time now so here was my chance. 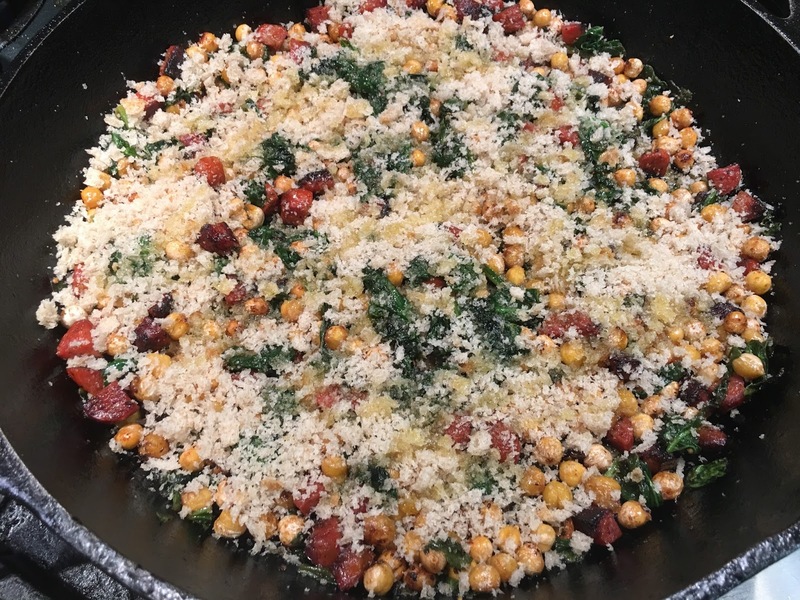 The video that accompanies the recipe on the page proved helpful to me so I'd recommend watching it if you decide to try it yourself. This is my take on the dish. 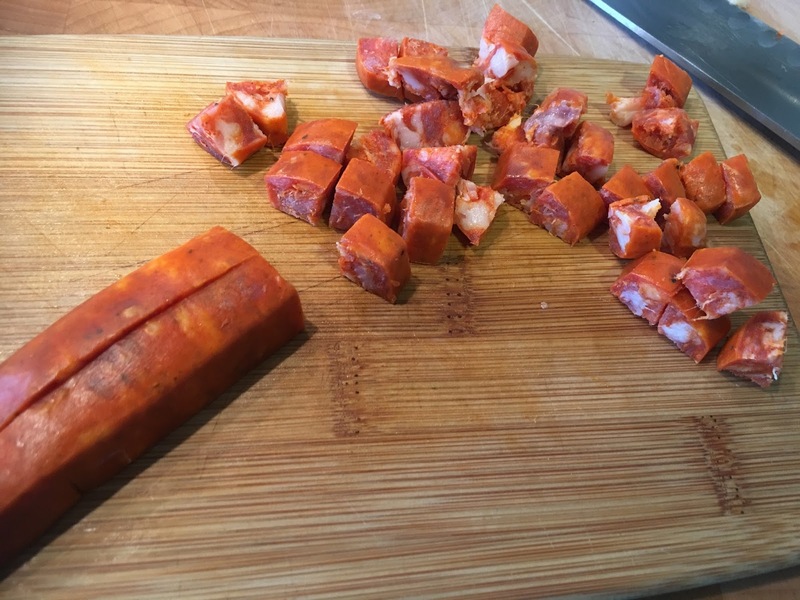 First I'll just mention one of my pet peeves with recipes that call for chorizo; I rarely if ever see a distinction made between the Mexican and Spanish versions in listed ingredients. Of course they are closely related but there are important differences both in the spices and flavorings used and in how they should be prepared. This article from thekitchn web site may help to alleviate confusion. 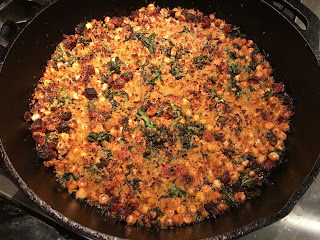 Chickpeas and garbanzo beans are interchangeable terms, however. 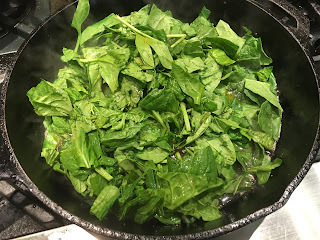 I rarely used them canned: I can taste the can 'flavor', there are sodium issues to consider, I love the resulting broth from when I cook soaked dry ones, and I've gotten into the habit of always having either soaked or cooked ones zip-locked and ready in the freezer to use. Check out this earlier post for a good chickpea recipe if you've never cooked them yourself. I always make my own bread crumbs using whatever bread I have, stale or fresh. If you are using canned chickpeas, make sure to thoroughly wash and drain them. For either canned or cooked, get them as dry as possible, even patting with paper towels to make sure they aren't retaining any moisture. 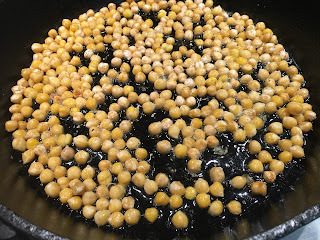 This will help the chickpeas to get a good amount of crispness. 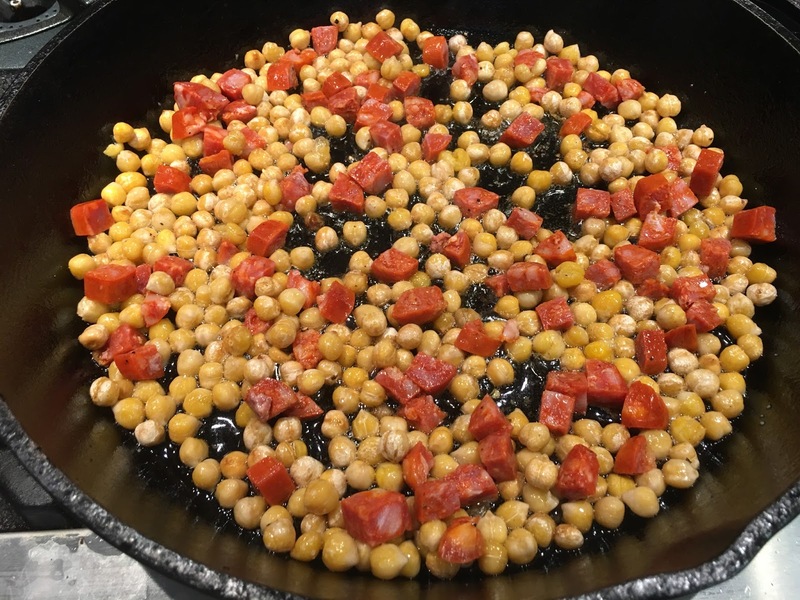 Put three tablespoons of the oil in a skillet large enough to hold chickpeas in one layer over medium-high heat. 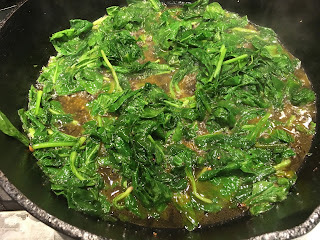 I used my 14" cast-iron skillet. 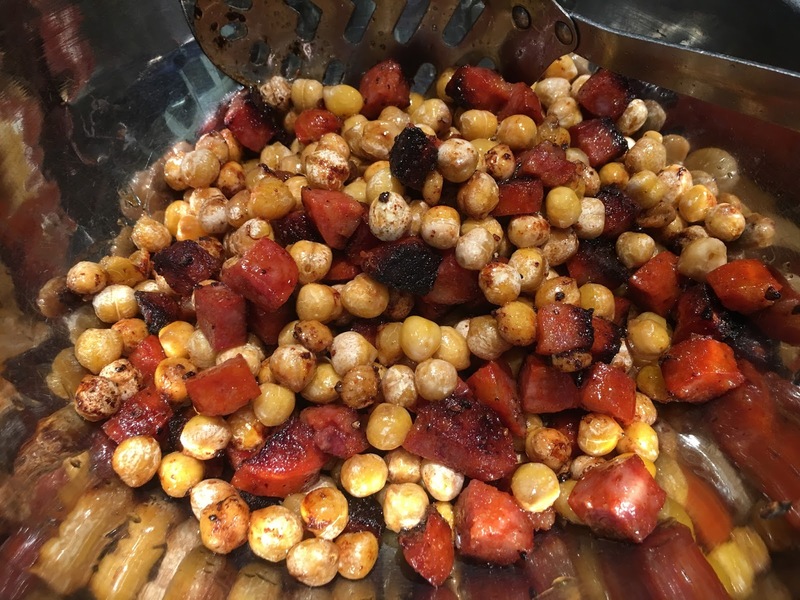 When it’s hot, add chickpeas and sprinkle with salt and pepper. Reduce heat to medium-low and cook, shaking the pan occasionally, until chickpeas begin to brown, about 10 minutes, then add chorizo. 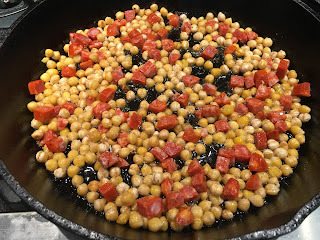 Continue cooking for another 5 to 8 minutes, or until chickpeas are crisp; use a slotted spoon to remove chickpeas and chorizo from pan and set aside. Add the remainder of the 1/4 cup of oil to the pan; when it’s hot, add spinach and sherry, sprinkle with salt and pepper, and cook spinach over medium heat until very soft and any liquid has evaporated. 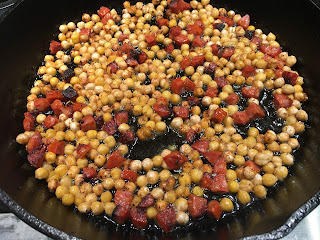 Add chickpeas and chorizo back to the pan and toss quickly to combine. 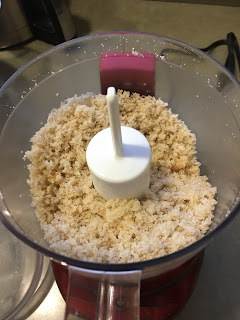 Top with bread crumbs, drizzle with a bit more oil and run pan under the broiler, about 3-4 minutes, to lightly brown the top.